Beginning in 2006, Time Warner Cable relied on a number of companies to provide cleaning services for their 17 locations across Southern Ohio and Northern Kentucky. This all changed in early 2015, when the second largest cable company in the U.S. decided to consolidate their custodial services with one partner serving their entire portfolio, in an effort to maximize communication and response time across their multiple sites. Time Warner sought a provider that could service retail and office space, large complexes and flexible one-hour cleans. Given the strength of their tailored solutions, GSF OHIO was awarded the contract, and we continue to grow our service partnership with TWC as their business needs evolve. GSF OHIO Account Supervisor Ebonie Colvin is responsible for developing solutions for TWC’s 197,000 square feet of space, including the challenges of cleaning the 24/7 call centers while employees are at work. 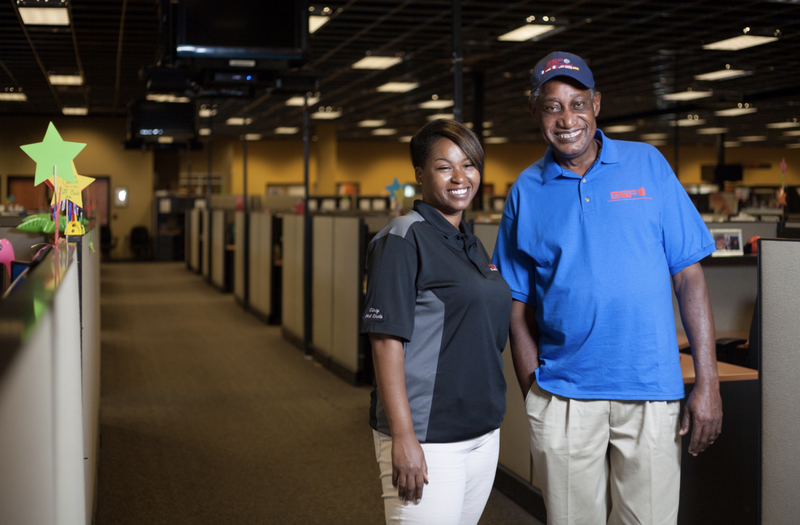 Desro Gaines, the Time Warner team’s Day Porter, is responsible for daily coverage of the call center/customer service location in Florence, KY.